Mvinix Systems, Inc., electronic components, electronic contract manufacturing, BGA, ball grid array, electronic manufacturing services, pcb testing, through hole assembly, pcb assembler, plated through hole, pcb prototype, multi-layer printed circuit boards, circuit board testing, circuit board prototype. Mvinix Systems is a premier electronic and manufacturing service provider for printed circuit board assemblies. We offer high speed, precision assembly of printed circuit boards. 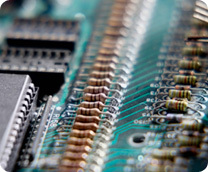 We can contract to provide a full range of PCB Assembly, PCB Testing, and PCB Design services. By handling your PCB design, layout, fabrication, assembly and procurement, Mvinix Systems, Inc. provides you with a unique, efficient, one-stop solution for all of your printed circuit board (PCB) needs. We are committed to providing our customers with the highest quality of product and services. At Mvinix Systems, we offer in-circuit, functional and flying probe testing in addition to a myriad of technical machining needed to produce the highest quality PCB assemblies. Our tests verify that components have been properly placed and electrical continuity exists at the proper places on the circuit card. Our quality control standards are a priority in serving the needs of our customers, because manufacturers often rely on suppliers to assure quality control for subassemblies, rather than providing the quality control themselves. We adhere to strict quality control standards and invest in high-tech and high quality production. Copyright © 2007. Mvinix Systems, Inc. All right reserved.